Lean Plastics Manufacturing, TPS for Plastics Manufacturing - Productive Plastics, Inc. Since 1998, Productive Plastics, has committed to become a “Lean Enterprise” by incorporating the Toyota Production System (TPS) and Lean Manufacturing Principles into our manufacturing, engineering, design, and administration processes, as well as embedding these concepts and practices in our company culture. This commitment is a large contributor in Productive Plastics ability to provide our customers with the most efficient, timely, innovative, and valuable heavy gauge thermoforming solutions in the marketplace. What is Lean Manufacturing and a Lean Culture? 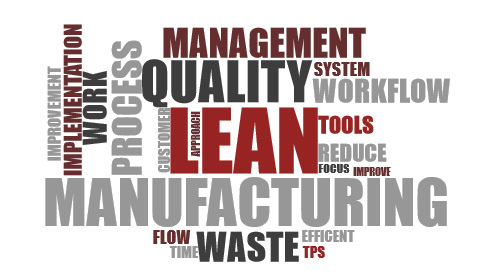 The basic definition of lean manufacturing is to identify and eliminate any process or activity within the manufacturing system that does not add value, commonly known as waste (Examples – unnecessary movement, over-processing, or avoidable part defects). The basic steps in lean manufacturing are determining customer value, evaluating current operations methods and mapping out new and improved value streams that will ultimately lead to manufacturing excellence. Lean manufacturing is a cultural revival, the true value of lean manufacturing lies in the organizations ability to reduce the waste that is contaminating the manufacturing processes. These lean methods must be integrated into the manufacturing culture and continually evaluated by the TPS process. TPS allows the company to view its manufacturing processes through the eyes of its customers. These include both internal and external customers who are affected by the results of the processes. This unique manufacturing process constantly identifies non-value added waste or overproduction including but not limited to wait time, inter-plant transport of products, excess inventory, needless motion and defects. It is the responsibility of all company associates to identify these areas of waste and make management aware of opportunities for improvement. Once identified, tier one associates conduct a Kaizen event allowing for the evaluation of the suggested improvement to determine a path of implementation. Senior management at Productive Plastics is committed to TPS as the way to exceed customer expectations by supplying quality components in the shortest lead times at value based prices. With ISO 9001:2015 registration, UL certification, and Lean/TPS, Productive Plastics is able to offer the highest quality products and services for our customers. Please Contact Productive Plastics, one of the most innovative thermoforming companies, for assistance or to get a quote for contract plastic thermoforming manufacturing. Request a free Heavy Gauge Plastic Thermoforming Process and Design Guide from Productive Plastics. Heavy vs thin gauge plastic thermoforming – what’s the difference? What Plastic Thermoforming and Manufacturing Content do you Find Valuable? Plastic Thermoforming, Pressure Forming, and Vacuum Forming – What’s the Difference?